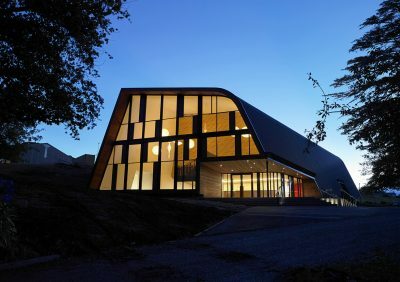 The Blyth Performing Arts Centre sits amidst the trees on a gentle slope near the entry to Iona College as a new symbol and public gesture of welcome. 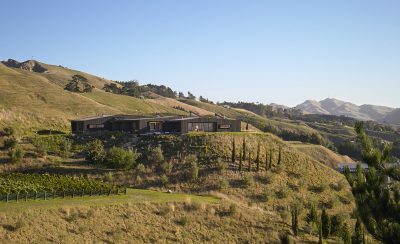 The strong sculptural language of sinuous curves and angled planes is drawn from the shapes of musical instruments and the folded landscape of Te Mata Peak. The great metal roof is bent and shaped into a form that is taut yet graceful, and resonant with energy. The Entry Foyer is a dramatic double height space which empahsises the ‘sense of occasion’. It is a flowing space with areas for reception, bar, sitting and gathering. The expanse of glazing orientates and connects the Foyer to the landscape beyond. The Concert Chamber is a generous and elegant room with finely tuned acoustics, like a musical instrument. 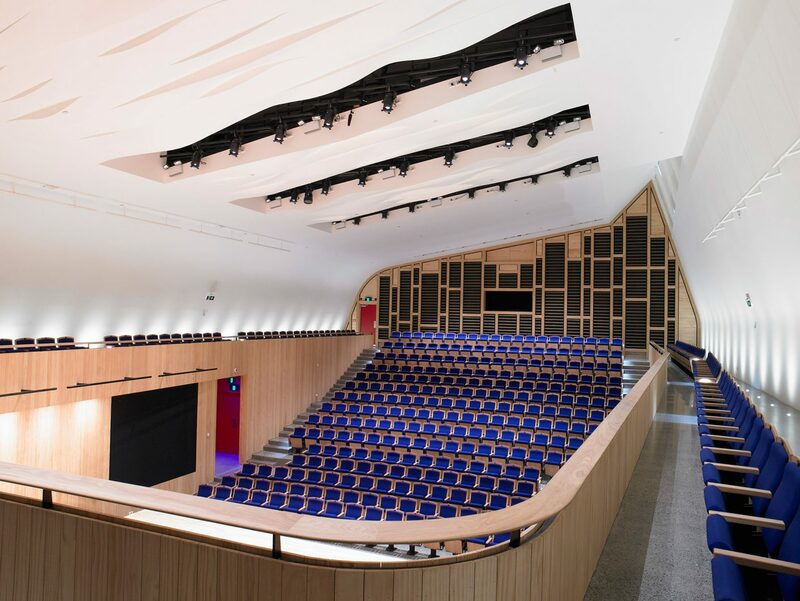 It has tiered seating for 300 people in the centre and a further 100 seats around the balcony, creating an engaging theatrical atmosphere. The asymmetrical curved ceiling and angled walls give the space a sculptural quality and a sense of spatial intrigue. A high window brings in natural light from the south and a low window frames a view to the landscape. The Back of House facilities are designed for the efficient movement of performers and instruments. The Green Room located to the side of the stage has a visual connection to the Concert Chamber. The Loading Bay and Plant Room are discretely located at the rear of the building. We believe the best architecture is a perfect synthesis of form and function, not only should it be beautiful but it should be beautiful to use. 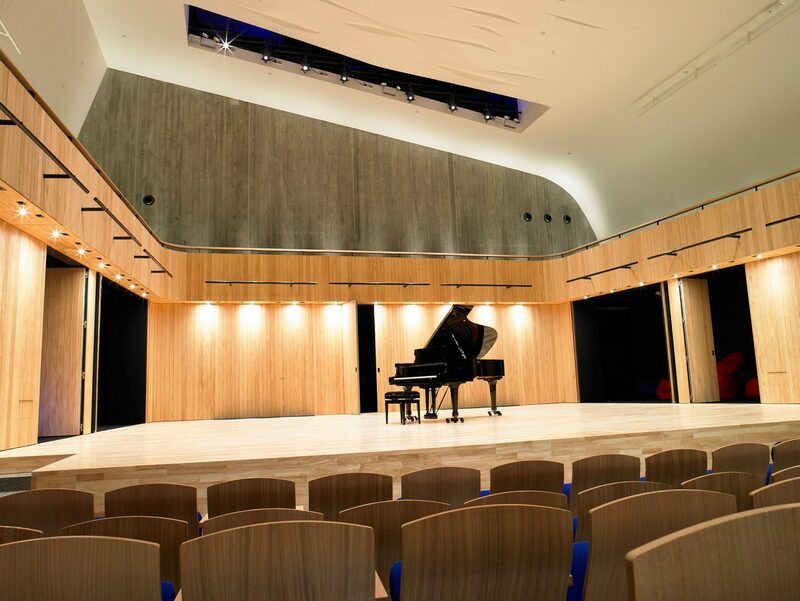 With our design for the Blyth Performing Arts Centre we aimed to create an architectural expression of strength and grace, and an experience that approaches the sublime beauty of music.